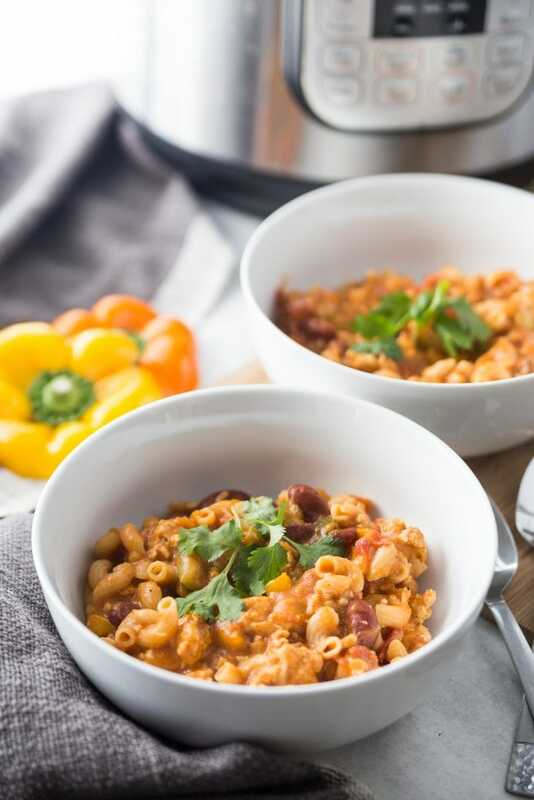 This Healthy Instant Pot Chili Mac is the perfect pairing of two of my favorite meals: chili and mac and cheese. 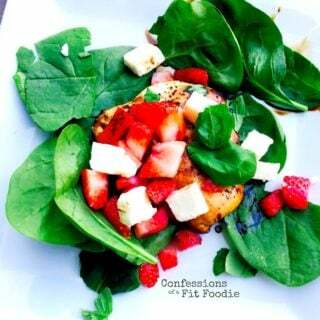 Perfectly portioned for the 21 Day Fix, and gluten-free, too! This is a healthy meal for the whole family! I will confess to a bit of a holiday hangover this week…there is so much to DO around here as my house still looks like a Christmas tornado hit and January is the biggest month of the year on the blog. But I still feel a little unfocused, and I am writing this, I am thinking maybe because the holiday ended midweek? I bet by the time this post goes live, I will be fully back in the game! ? Anyway, welcome to the first official recipe post of 2019! And friends, it’s a damn good one. 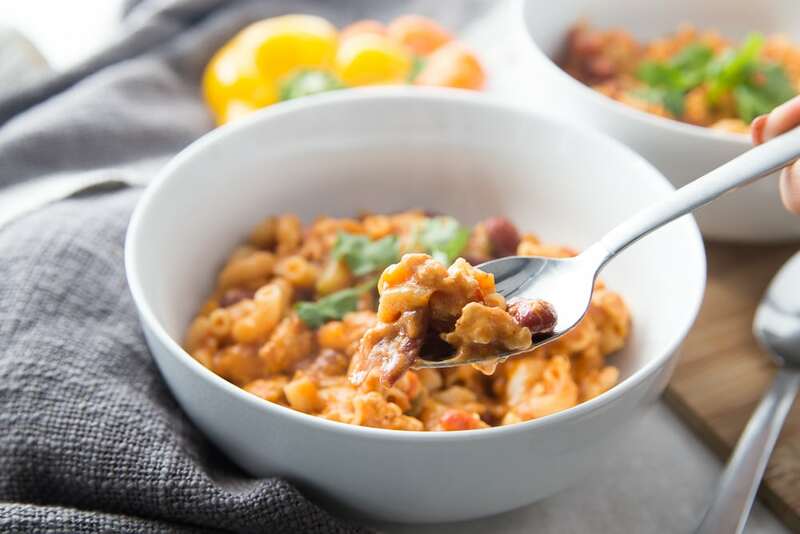 This Healthy Instant Pot Chili Mac is puts two of my favorite things on the planet together: chili and mac and cheese. I actually grew up eating chili with little elbow noodles in it, but that extra layer of melty sharp cheddar cheese really takes this to next level deliciousness. 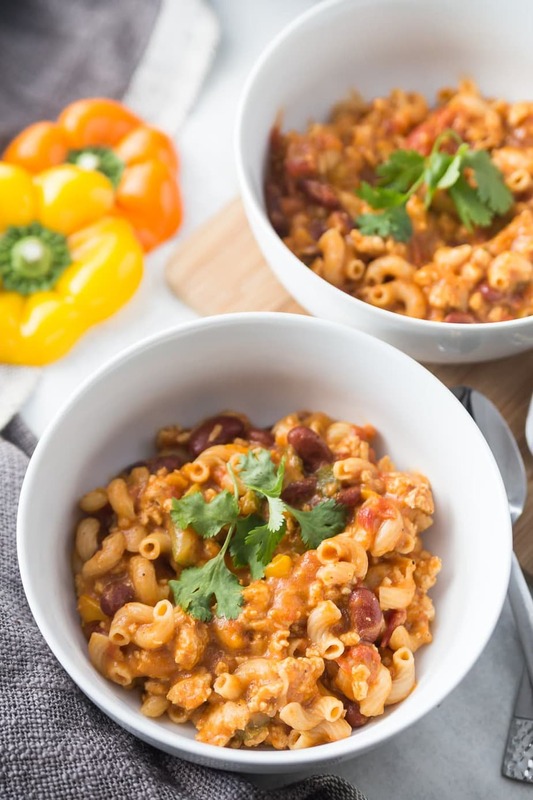 And thanks to the Instant Pot, this Healthy Instant Pot Chili Mac is so freaking quick. Like under 30 minutes, including time to come to pressure thanks to only two minutes of cooktime! 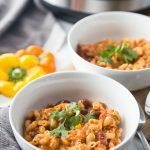 This Instant Pot Chili Mac comes together quick and uses lots of pantry staples and spices! You can use whatever ground protein you like for this recipe, but I was surprised at how delicious it was with ground turkey. And to get the green container up, I added a ton of veggies – onions, tomatoes, bell peppers, and zucchini. If you have picky eaters at home, you can try shredding the veggies to hide them better! As far as beans, I added kidney, but this would be great with black beans or even garbanzo beans. Use what you have. Or leave the beans out for 1/2 less yellow. And you can’t forget the cheese! I am partial to a very sharp cheddar, but you can sub Monterey jack or whatever cheese you like best. 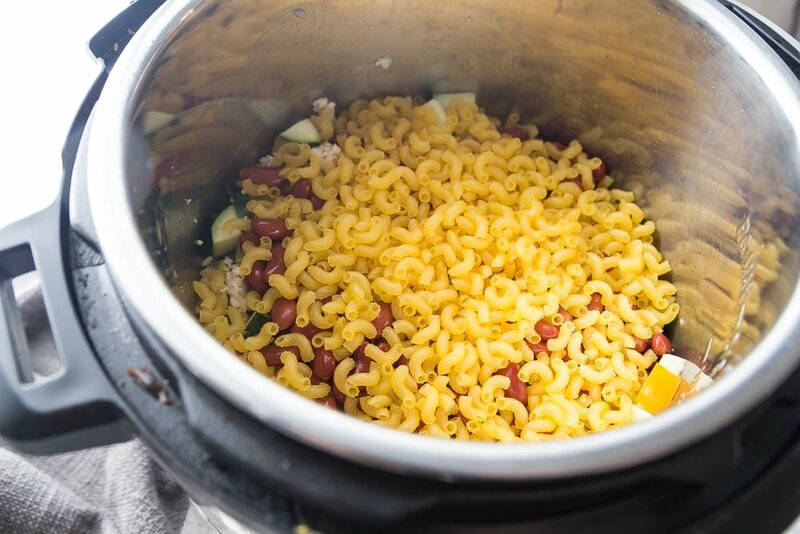 Is this Healthy Instant Pot Chili Mac Gluten Free? Yes! I used Gluten-free Brown Rice Elbows to keep this Gluten-free. My son also can’t have dairy, so I scoop out his portion before adding the cheese! I don’t have an Instant Pot? Can I make this Chili Mac on the Stovetop? Yup! I will add stovetop directions to the recipe card below! 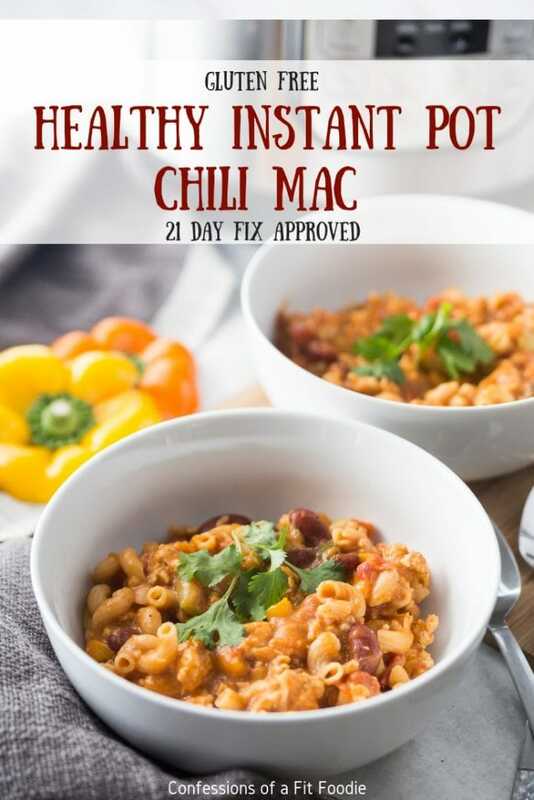 Can I have this Instant Pot Chili Mac on the 21 Day Fix? Of course! The container counts are in the recipe card! 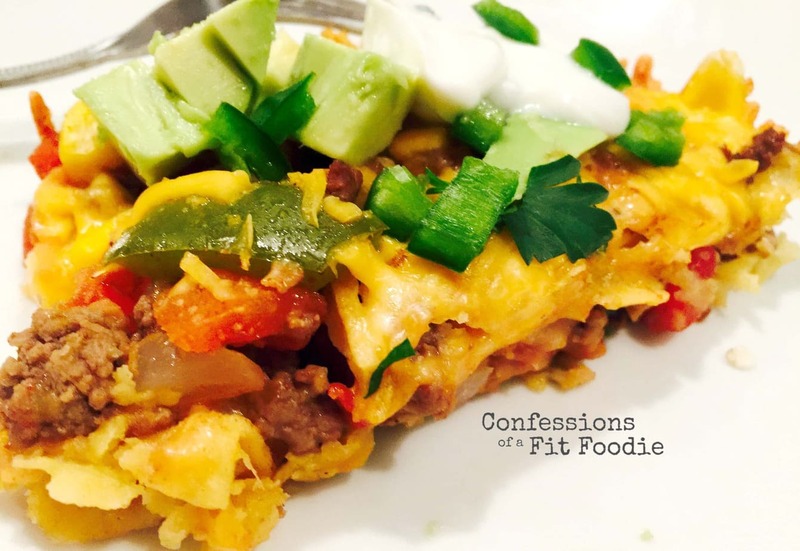 What are the 21 Day Fix Containers for this recipe? Guys – this is AMAZING for containers! First of all, it’s a HUGE serving size – roughly two CUPS! And yes, you use 1 1/2 Yellows for this, but if you really want to keep it to one, you can just omit the beans. But you also get 2 1/4 Greens for this meal which is complete insanity! It’s also 1 Red, 1/2-1 Blue (depending on how much cheese you use), 1/2 tsp. Set Instant Pot to saute and when it’s hot, add in the olive oil, then saute the ground turkey or beef until nearly cooked through. Add in onions, bell peppers, and saute for a couple minutes until fragrant and veggies begin to soften. Then add in garlic and zucchini, cooking for an additional minute. Be sure to scrape any browned bits off the bottom of the pot and deglaze with a few tablespoons of water or broth (¼ cup for 8 quart) if necessary. Mix seasonings and salt into tomato sauce, then set aside. Layer beans then pasta over the meat and veggie mixture, but do not mix. Top with diced tomatoes, then pour tomato sauce and spices on top. Again, do not mix. Set Instant Pot for 3 minutes. After cook time, do a quick release. When it’s safe to open the lid, give your chili mac a good stir, then add in desired amount of cheddar cheese. Garnish with fresh cilantro. In a large pot or dutch oven, heat olive oil over medium heat and then saute the ground turkey or beef until nearly cooked through. Add in onions, bell peppers, and saute for a couple minutes until fragrant and veggies begin to soften. Then add in garlic and zucchini, cooking for an additional minute. Mix seasonings and salt into tomato sauce. Add sauce to veggie mixture, along with the beans and diced tomatoes. Cook for 10 minutes to let flavors meld together and the liquid to reduce. Finally, stir in pasta and cheese. 21 Day Fix Container Count – 1 1/2 Yellow, 1 Red, 2 1/4 Green, 1/2-1 Blue (depending on how much cheese you use) and 1/2 tsp. WW Freestyle Points – Use 50% reduced fat sharp cheddar (1 1/3 cups), 99% lean turkey, and either whole wheat or chick pea noodles. 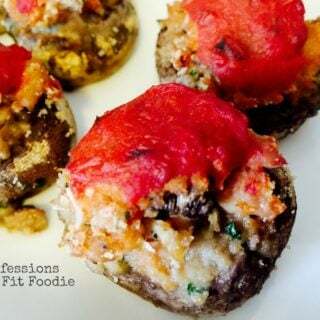 5 FP per serving (It jumps to 9 points per serving if you use 93%, but it is a HUGE serving. You can also halve the cheese)..
Back to school today so it was perfect timing for a new recipe! Delicious!! I used chipotle tomatoes for a little extra zing. What size pot do you use? Oooh! Fun on the chipotle tomatoes! I use a 6, 8 or 3…but for this I have mainly used my 6. This was fantastic. And so many veggies! Thanks for the great recipe. I am thrilled to hear this, Tom!! Would this work with whole wheat noodles instead of gluten free? Also does it freeze well? Recently started 21 day fix and found your website! Am think this would be. Big hit with my boys.! Yes! It will work perfectly! 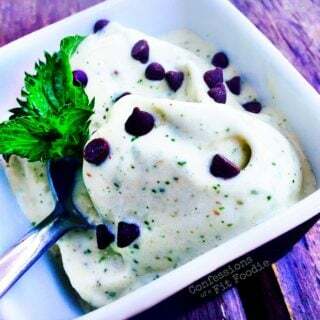 This was the first 21 Day Fix approved recipe AND my first Insta Pot experience. It was a hit. My household loved it and my fiancé who HATES cooked vegetables actually went back for seconds!!! It was easy, fast, filling and full of flavor! This will be a new staple in our home…thank you! Oh my goodness – that’s AWESOME!! So many veggies in this, too! Great job, Alexis! So many veggies! We all loved it! I haven’t tried this in a crock pot, but I feel like it would just be easier to make it on the stove all in one pot since you are having to cook the meat anyway? Make sense? This was delicious! I’m making it again for a group of 8 and needing to double the recipe. I was wondering if I need to adjust the cooking times, or is it best to make 2 separate batches? Thanks for all your wonderful recipes! How many green containers would you estimate 2 bell peppers to be? I only ask because mine are diced and frozen. Thanks!